I wonder if everyone of you DOUBLE CLEANSE your face every single day, even without applying any makeup? Double Cleanse isn't something new, yet it is part of the skincare regimen originated from the Korean. Double cleansing involves double works of cleansing action, first using a remover and second facial wash. It is an essential action of removing make up or any impurities on the face before cleansing our face with facial wash. Even with or without any application of makeup and sunblock, we should always double cleanse our face. It helps to keep our face cleansed, without any sebum, dirt and impurities. 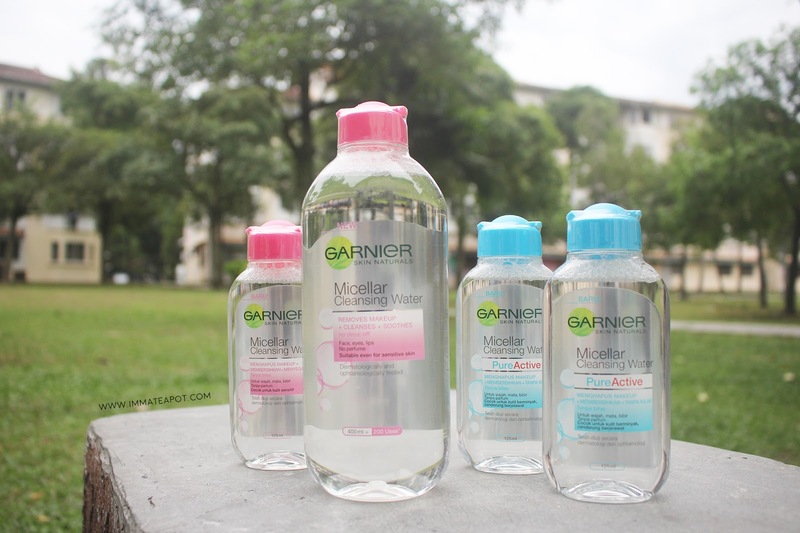 In this post, I gonna share my current favorite daily cleanser - Garnier Micellar Cleansing Water! Garnier Micellar Cleansing Water, claims it is the first all-in-one cleanser that purifies and removes our makeup only in 1 gesture without any involvement of harsh action like rubbing. Enriched with the Micelles molecules, this cleansing water works like a magnet that gently remove and cleanse our face without the need of rinsing off, while leaving our skin soft, hydrate and sooth! Wait! WITHOUT NEEDING TO RINSE OFF? Yes! No rinsing action involved after all! 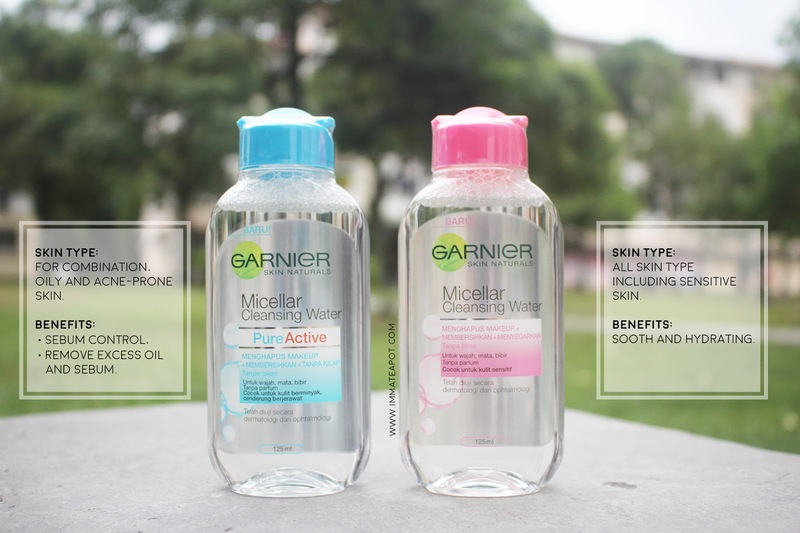 Garnier Micellar Cleansing Water comes with two variants, the usual one (pink) and Pure Active (blue). 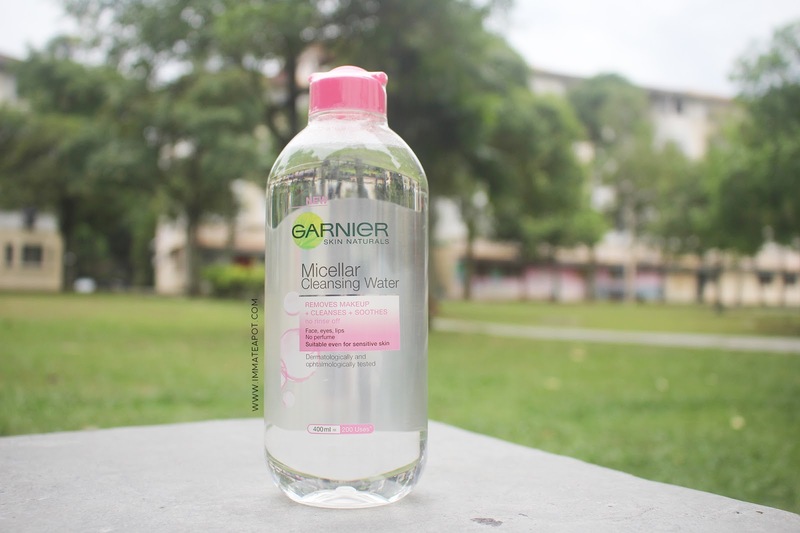 Garnier Micellar Cleansing Water (pink) removes makeup and impurities while sooth and hydrate the skin. 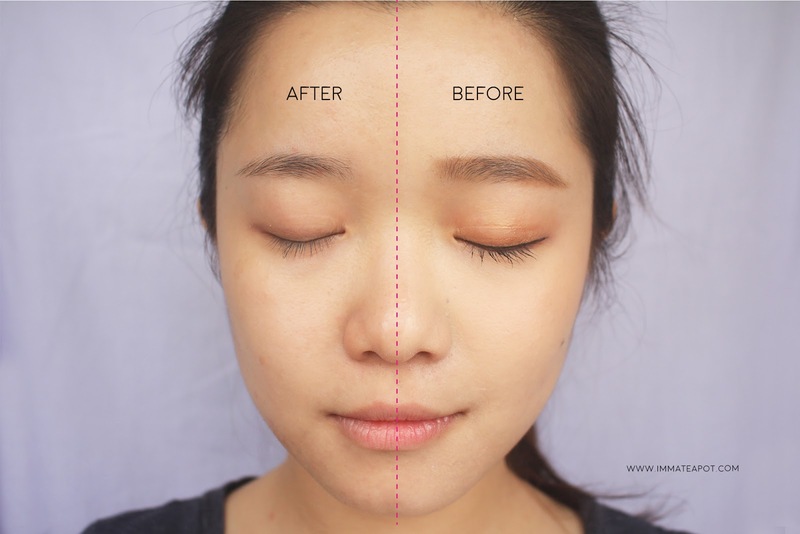 It suitable for normal to sensitive skin. Garnier Micellar Cleansing Water PureActive (blue) removes makeup, impurities and oil on skin while controlling our skin sebum without drying out the skin. It suitable for oily to acne-prone skin. 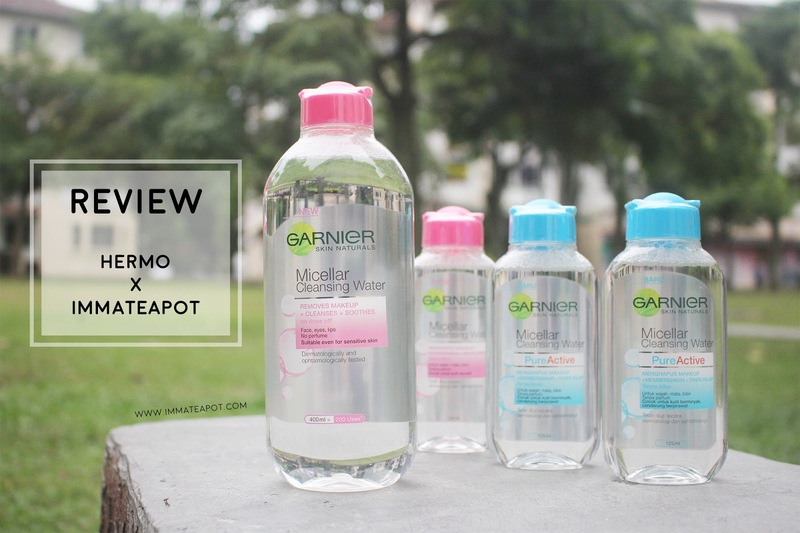 Lets jump into the review on Garnier Micellar Cleansing Water to check out its effectiveness! 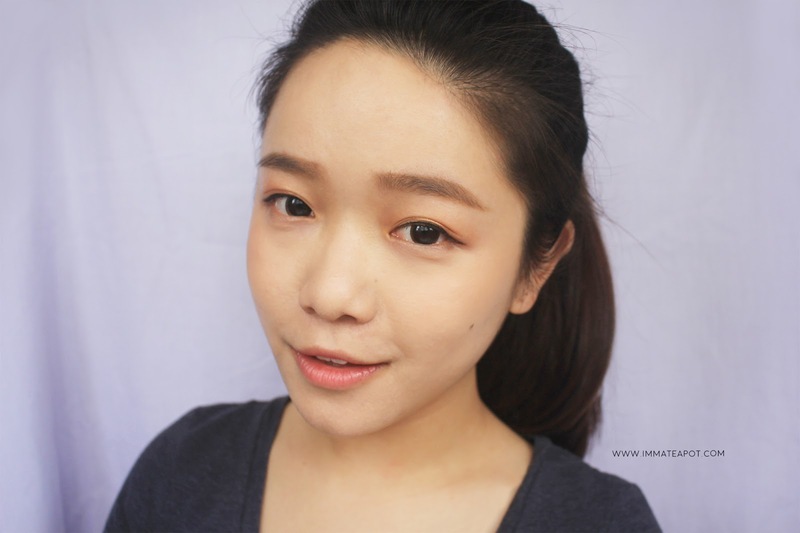 Here's my full face with simple makeup, with the application of bb cushion, some waterproof eyeliners and mascara, colored lip balm and light eye shadow. 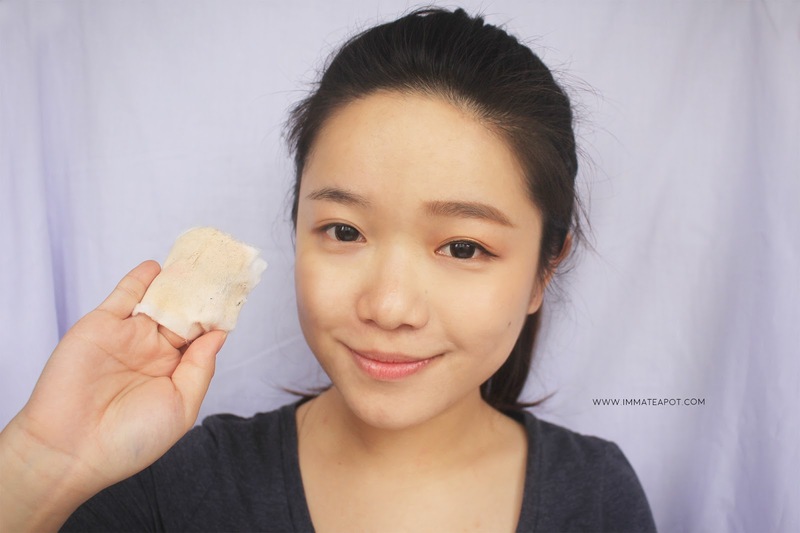 Pour a generous amount of cleansing water on the cotton pad. It comes in liquid texture, without any perfumed scent, which reminds me of the clear water. 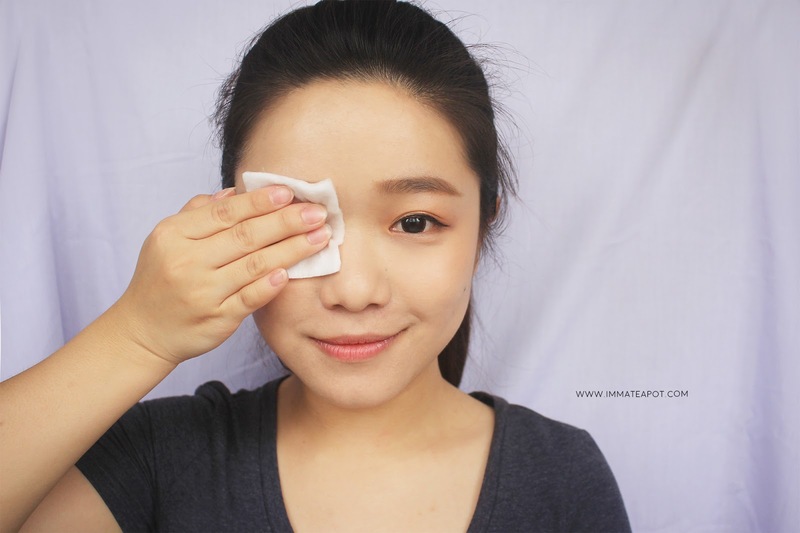 Coat the soaked cotton pad on the eyes for few minutes. Tadaa! In ONE GESTURE, it removes all the eye and brow makeup. For a clearer picture, I have removed half of the face makeup. Surprisingly, it removes the waterproof eyeliner and part of the mascara as well! Personally, I have used quite a lot of removers from different brands and in different textures, from gel, milk, balm and water. Most of the removers may cause some irritation and inflammable feelings on my skin. I ended up throwing them away and go for something mild. Wait! Promotions for my readers! 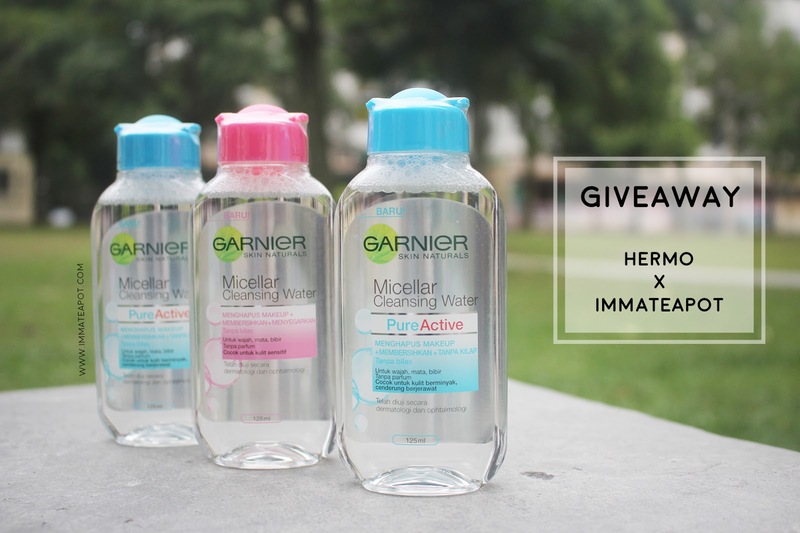 Use the promocode [HERMOXAMELIE] to get additional 10% off any pruchase of Garnier Micellar Cleansing Water! *not valid on OMO deal. Wait! Wait Another Promotions for my readers from Hermo! Wait! Wait Wait! It's time for Giveaway! 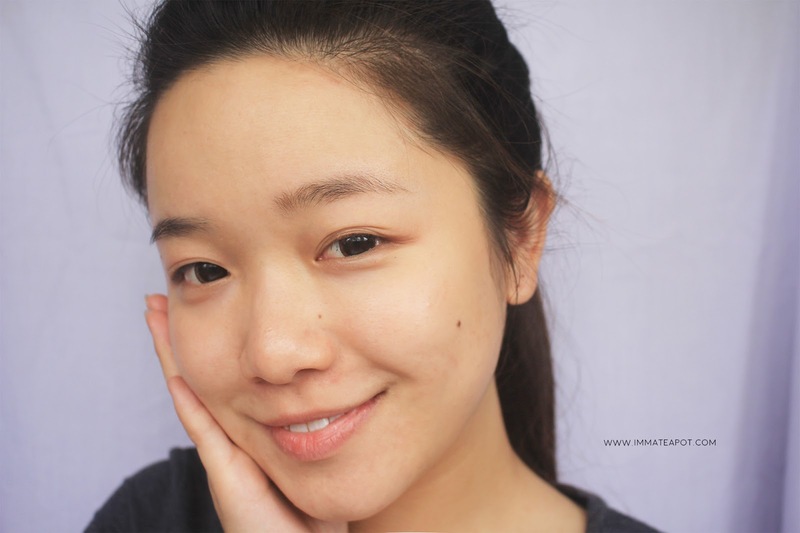 Follow Amelie's blog and comment on my blog below with "I wanna cleanse my face everyday with Garnier Micellar Cleansing Water"
Share this picture on Facebook [Click in to share] with caption "I wanna cleanse my face everyday with Garnier Micellar Cleansing Water". Tag @hermomy @amelieyap and 2 of your friends! * Winners must complete all steps above. * 3 winners will be randomly chosen and announced on Amelie Yap's Facebook Page. * Giveaway ends at 10 November. I use this! It's really good and gentle on the skiin! I use it too and loved it, especially when I have lash extensions done! So convenient and gentle! 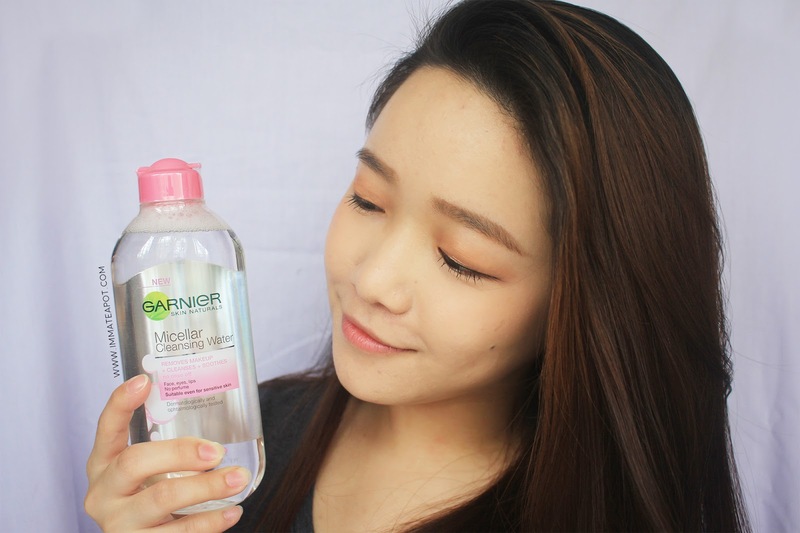 I wanna cleanse my face everyday with Garnier Micellar Cleansing Water. Have been hearing so many good reviews about this product, would really love to try it! By the way I like your eye shadow, simple and sweet! WITHOUT NEEDING TO RINSE OFF!! this is Great!! the micellar water craze is surely catching up, yeah? tried other brands before and it works great! will try out garnier next! Would love to try! I am currently using their facial wash and I like it. I wonder if these are available at Guardian or Watson's. I'd like to check them out rather than from online stores. this is like a premium toner ? i used garnier toner for a long while, it is really good! looks good, must be really refreshing. hmm, not for me though. Hi Teapot! Pika here.. we met at the Mamonde event recently. By the way, Your skin good as it is! Ohh yahhhh... I wanna join this giveaway! Hehehehe.. So here it is.. Your camera quality looks so awesome! can I know what camera you're using? I prefer water base make up removers too, currently using a Japanese brand one but it's too pricey. Might try this out! Garnier is a nice product though most of the time I end up cleaning with a cream as have got a dry skin. Tutu app store is that it sustains readymag.com both Android and iphone gadgets. This know more application shop could be worked Download Tutu Helper APK for Android, iPhone/iPad & PC on KitKat, Lollipop and also Marshmallow tutuapp as well seamlessly. The remarkable component about Tut app Tutuapp Helper store is that this app shop will certainly make you absolutely addicted. When it involves Android devices most Kodi customers set up apps from certain sources Know More like the Google Play Store or the Amazon App Store, or Amazon's shop on these Kodi App Download Fire TV devices. we still favor Western Alpinism based on experience tumblr.com/ the business has actually made premium backpacking bags for years Official Website with radiant reviews practically throughout the board. Patagonia is new to the market The Best Men's Backpacking Sleeping Bags of 2017 the facility zipper wasn't a video game changer for us. over-blog.com/ is very easy to clean and also enjoyable. Our Blog It just sustains up to pounds of Top Finest Baby Walkers|2017 Evaluations weight and also to promote motor skills growth.